No Items in Inventory at this time. 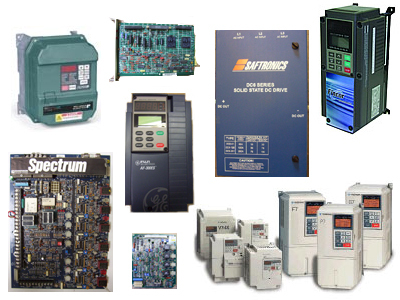 Surplus Boards has been providing reliable industrial electronic repair service to our customers since 1999. Surplus Boards Inc is an industrial leader in AC and DC drive repairs. We are an independently owned company and operate from southern California. Over the last 15+ years we have gained an excellent reputation not only for the reliability and speed of our repairs, but also for our low prices on used, refurbished, and new drives and boards. Our engineers collectively have over 65 years experience in the industrial AC and DC drive repair business. Many of the refurbished boards and drives we offer are purchased from users that are replacing or retrofitting their machinery with new state of the art drives. Their used drives are collected, cleaned, and repaired if necessary. We then are able to offer these electronic boards back to the public at a fraction of the cost. In some cases, the drives and boards we offer are obsolete and no longer available as from the manufacturer. All remanufactured items have been thoroughly cleaned, rebuilt, and tested for functionality before shipment to the customer. We warranty all our inventory for 30 days. If you purchase a remanufactured unit and you have a repairable identical unit, we can provide an exchange at a discounted price. Click the manufacturer below to start browsing our inventory. If you are unable to locate the drive / board from our stock we can usually locate a part. We have an extensive stock of refurbished and new equipment, including boards, complete drives, and PLCs. If we are unable to supply from our own stock we can usually locate a part. In most cases our refurbished sale prices are lower than most of our competitor's repair prices. Please use the links on the left to navigate our inventory. We also can service and repair a wide range of electronic AC and DC drives. Please contact us for a quote. All major credit cards accepted. PayPal is accepted. Money orders or checks also accepted but may delay the shipment of the order. Shipping cost will depend on the shipping location and the purchased item weight. Some item require a 2% handling fee. Items will be shipped within 1-3 days of payment via FedEx. We offer FedEx Ground or Express (overnight & 2nd day) service. Tracking number will be emailed once package has been shipped. All item will be properly packaged and insured. International Orders - We do not ship international. We make every effort to insure the quality of each shipment and to properly package your items. If the box appears intact, but you discover damage to the contents, please contact the carrier and us immediately. Our dedicated customer service team can address all enquires. Please do not hesitate to email, fax, or call us. Our customer service team will contact you within 24 hrs. Copyright © 2015 Surplus Boards Inc. All rights reserved.